This week’s prize has been donated by The Lollipop Tree, who specialise in “boutique chic at sweet prices” and stock beautiful vintage-inspired homewares, jewellery, accessories and toys. 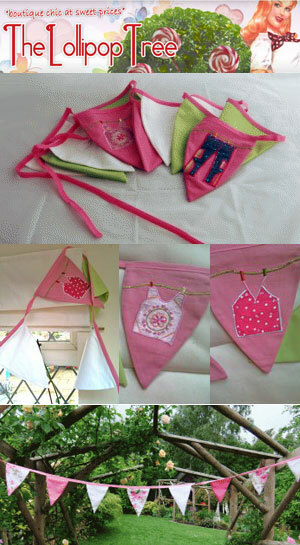 Pink linen bunting, handmade by Evangelina Designs in North Yorkshire. This beautiful linen bunting adds the finishing touches to either a bedroom, outdoor space or to your party decorations. Each piece is approx 3m long end to end with alternating pink, pistachio green and white linen triangles strung along a pink ribbon. The applique pieces vary and feature embellished items of clothing. For your chance to win, simply tell us your favourite item from The Lollipop Tree and let us know in the comment box below. We’ll pick a winner after entries close on Thursday 7th June. The winner will be announced on this blog soon afterwards so don’t forget to check back or subscribe! We will contact the winner shortly afterwards and pass their details onto The Lollipop Tree who will send out the prize directly. My favourite is the London Icons Cushion it’s very cute! The Bird photo frame is lovely, it would look perfect in my bedroom ! I love the regency cups and saucers and the ship’s decanter. Vintage ‘Cleo’ Choker Necklace-IT’S GREAT! I love the “I love Paris” pillow. I mean come on. So totes cute. Thanks for having an awesome giveaway! Tin and wooden love letters garland is the item I love. I loved the Eiffel Tower cushion.. hard to pick though, lots of lovely things on the site! cupcake luggage tag – kitsch cool! Hanging ballerina decoration – I’m a christmas freak! I love it!! This decoration is so beautiful! I love the vintage rose bunting, London Icon;s cushion, the dragonfly clip, and many others to choose.june2nd 2012. I love this London Icons cushion! My favourite item is the Strawberry Charm Bracelet. The London Icons cushion would look perfect on my sofa. The Vintage Marcasite and Seed Pearl Necklace – utterly beautiful! London Icons Cushion is lovely! Double strand aurora borealis crystal necklace – beautiful.love it! I love the Vintage “Vivienne” Pearl necklace. The pair of handpainted champagne flutes are very sweet. Would love them for my wedding! I love the I Love Paris pillow…it is soooo sweet!! Love the Mini Star Lantern! I love the strawberry cushion – lovely and girly! I love Londons Icons Cushion, with the Jubilee celebrations and Olympics coming soon, London is the place to be! Love it. I adore the cupcake umbrella, I need a beautiful brolly as I’m sure it will rain on my wedding day! Tin and wooden love letters garland is beautiful and would go with my furnishings perfectly! I love the green pouch purse! The Hanging Hearts Memo Clip Organiser is my favorite item, anything that help me get a little more organized is always welcome. I love the Gisela Graham Snow Fairy. The competition bunting is so cute. i absoutly adore the cupcake umbrella . I like the Strawberry cushions – they are great! Oh, I want everything on there! I love the Pirate Bunting it would look great in my son’s bedroom. I love the vintage rose bunting…so sweet!!! I wish I had a lollipop tree in my garden. That’s one tree I’d certainly eat the fruit from 😉 My favourite item is the Vintage rhinestone necklace – lovely! i love the mini star lantern – lots of beautiful stuff though, hard to pick one favourite! My daughter loves the Happy Strawberry Necklace. Love this http://www.thelollipoptree.co.uk/vintage-home-accessories/tin-and-wooden-love-letters-garland.html and so many other items too! All gorgeous! Love all the different buntings as well! It really reminds me of something my nan had when I was a child, beautiful ! I love the Adele Marie pistachio green pearl necklace. What a gorgeous shade of green. ‘Agatha’ vintage marcasite necklace – it looks fabulous!! i love the toadstoll skipping rope its fab! my daughter would love them have bookmarked for xmas! I am in love with the London Icons cushion, a perfect year to celebrate our country.